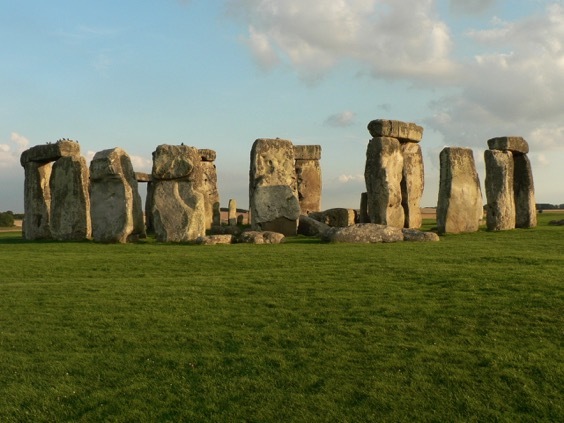 In light of the Solstice, we celebrate the summer with an article on the Stonehenge Landscape. I struggle to keep up on an unexpectedly warm autumn evening as I galumph my way across rough downland in pursuit of a tour guide. Pat Shelley is leading me from one location which boasts a million visitors a year to another that only a few hundred manage to see. I’m grateful for his expertise because across the hummock-strewn field ahead lies Stonehenge Cursus, a curious feature every bit as enigmatic as the main attraction. I had thought that getting off the trampled track so close to the well-beaten A303 would be a near impossibility. To do so within sight of Stonehenge which is, after all, the acme of tourist attractions, would be harder still. So, when Shelley - a local tour guide I had met the year before - got in contact offering a social drink and an evening around the stone circle, I have to say I was very much looking forward to the beer. Shelley’s enthusiasm for, and knowledge of, Stonehenge is unsurpassed. He’s spent years showing tourists around the area and has helped out on many archaeological digs, a background that helps him synthesize all the latest theories and ongoing work around the monument, seemingly at the drop of a hat. He wanted to show me something that very few tourists get a grip on - that the landscape around Stonehenge is every bit as important as the stones themselves. Recent archaeological work has uncovered many links between it and other monuments - among them, Durrington Walls and Woodhenge to the east and ‘Bluestonehenge’, discovered earlier this year by the Stonehenge Riverside Project next to the River Avon - and these links suggest that the Stonehenge Landscape was, indeed, huge. The Stonehenge Cursus, recently dated to between 3630 and 3375 BC, is nearly two miles long and ranges from three to five hundred feet in width. On the Ordnance Survey map it appears as a prominent rectilinear feature amongst the blunderbuss grapeshot of Neolithic and Bronze Age barrows that lie spattered across the Wiltshire landscape. So it comes as a shock that the Cursus is barely perceptible on the ground - an indeterminate ditch and bank arrangement which only resolves itself as a wide gap cut through a hangar of trees at its western end. After a few moments of disappointment, I adjust my expectations and imagine the sheer scale of the endeavour. I remind myself that the most spectacular forms on the planet are often ones for which no particular purpose springs to mind, enchanted as we are by the brute pointlessness of ancient lines on the landscape - lines which can only really be appreciated from above. Indeed, nobody has the slightest idea what it or any of the hundred or so similar features in Britain are actually for; all explanation defaults to a mumble of ‘ritual use’, which, Shelley informs me, is an archaeological euphemism for ‘we don’t really know’. One thing is certain, however: apart from what remains of the outline of this great human mark, there is precious little archaeology actually on it. Given our ancestors’ implied lack of care with their coins, combs, tools and artefacts, it is odd that a huge area that probably took thousands of man hours to construct should be so bereft of human clutter. It is almost as if it had been kept consciously clean. While I mumble about the minimalist Neolithic to myself, my guide takes off across the field, promising to show me something that I would never forget - as if in compensation for showing me something that I could barely see. As anyone who has spent a merry hour or two queuing on the A303 will tell you, Stonehenge is a prominent feature. While it melts sympathetically into views of its immediate vicinity from the middle distance, at close quarters you just can’t take your eye off the thing: it dominates the landscape and, moreover, it seems to be following me around now, forever in my peripheral vision in a way I imagine it must have been for our ancestors. I catch up with my guide at the foot of a low eminence, turn around and it has vanished - which is disturbing, given that it is only a few hundred yards away. We are on The Avenue, a grand, curving earthwork ‘road’ almost two miles long that seems to be a processional walkway from the River Avon to the henge. Shelley is motioning to me to walk up towards the circle and, as I do, I can’t help gasping as the familiar outline of Stonehenge reappears, rising above the grass and thistles in a strange inversion of druidic tradition. It suddenly becomes clear that Stonehenge is more than a familiar pile of stones, but part of a larger landscape, even a stage-managed experience. Like the best theatre, Stonehenge can still surprise.